Jessica (via email): How much should a keg of Anchor beer weigh? Bob: I’ve been asked this question a lot over the years, Jessica – usually when a bar wants to reconcile their daily receipts with the volume of beer used. The only real way to determine how much beer is left in a keg is to weigh it, but you have to know how much it weighs to begin with. 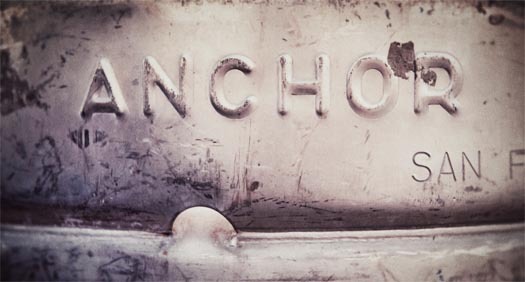 A full keg of Anchor beer should weigh about 140 lb. The empty weighs about 30 lb., but can vary a bit depending on the manufacturer (we’ve had several), and the beer itself weighs 110 lb. For all practical purposes beer weighs the same as water, which is 8.34 lb. per gallon or 2.2 lb. per liter. A 50-liter keg X 2.2 lb. = 110 lb. If you want to be picky you can figure in the ABV of the beer and subtract the difference in weight because ethanol weighs 6.584 lb. per gallon. But the difference is slight, something like 1.075 lb. in a 50-liter keg of 5% ABV beer, and is somewhat taken up by the fact that beer contains heaver compounds. That’s why we use water weight as a general rule. It comes pretty close regardless of the beer.